Seniors and anyone with a balance issue should never be recommended to use 2-piece or 3-piece twist-lock or flip-lock walking poles. The members of the Senior Hiking Group above are 100% using quality one-piece poles sized to their specific heights. One-piece poles prove to be safer, lighter, stronger, more durable and much more user-friendly than cheap/flimsy collapsible poles flooding the market from China. I use 150cm cross country ski poles when classic skiing. Pole length doesn’t need to change due to terrain changes. I’ve been coaching ski racing for over 30 years and I refuse to fall for all the marketing hype about collapsible poles. My vote is don’t buy them. Look for quality one-piece poles sized for your specific height. When I teach Nordic Walking Classes all my students use the correct length poles. We don’t start out with short poles that provide poor biomechanics and bad habits. We start out with the Perfect Length Poles. Perfect length poles help us to automatically walk with a super straight back – better walking posture is biomechanically a good thing. This improved walking posture, when combined with the unique 4-Wheel-Drive type action of walking with poles radically, reduces the stress to the shins, knees, hips, and back. Nordic Walking is low impact and yet provides a highly effective workout – burning more calories and working more muscle groups than regular walking. Don’t get scammed by collapsible poles. Not only are they falsely marketed they are almost ALL made in good old China and cost anywhere between $20.00 and $200.00 per pair. 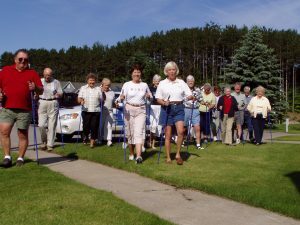 None of them meet our quality standards here at WWW.SKIWALKING.COM and the American Nordic Walking System. Skiers never use cheap/flimsy collapsible poles. They would destroy the cheap/flimsy twist-lock and flip-lock gadgets. Skiers use one-piece poles. 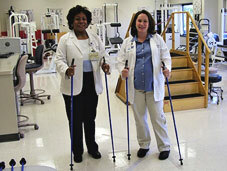 Seniors and anyone with a balance issues should avoid collapsible poles. One-piece poles are also superior for everyday use for athletes. Please let me know if you have any questions at any time.